If you are working on getting your 1974 1975 1976 1977 1978 Trans Am and Firebird back to stock or want a car you can drive very hard yet have it handle like a dream we can help! 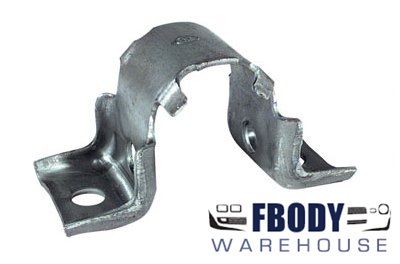 From replacement stock suspension parts like tie rods, to bushing kits and complete aftermarket suspension systems Fbodywarehouse has you covered! 1967 - 1981 Camaro Trans Am NEW Radiator Support Bushing Kit. This item is a must have for anyone rebuilding your car's front end. One of the fastest areas of wear out is these bushings. This kit includes all the correct bushings, heat treated bolts, and washers to remount the radiator core support to the front frame rails and front clip.. This is a pair of Used GM rear axle bump stops for 75-81 Camaro and Trans Am / Firebird. These mount to the body above the rear axle and as the rear end bounces up, it prevents the axle from bottoming out on the frame. These are used GM units which could use paint but the bumpers are all intact. This is a used GM power steering box dust cover for 70 - 81 Camaro and Trans Am. This unit straddles the power steering box and the lines come out of this cover. Used GM unit in good shape install and go! 1970 - 1981 Camaro Trans Am Steering Mid Shaft Dust Cover GM Nice! This is a used GM mid shaft dust cover for the steering column mid shaft. GM unit in great shape install and go. Fits all 1970 1971 1972 1973 1974 1975 1976 1977 1978 1979 1980 1981 Camaro Firebrid Trans Am models. 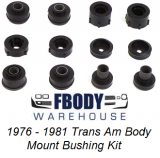 This is a 100% correct reproduction of the factory rubber bushings for 1967 - 1981 Firebird Trans Am! 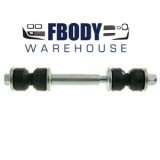 These are made to replicate the original GM body bushing in every way. The kit also includes the radiator support bushings! There are 12 bushings per kit. These bushings and hardware replace the factory bushings which connect the front sub-frame to the body hull of the car. Use the drop down menu below to select year desired! 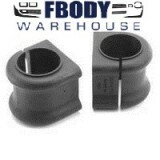 This is a pair of new replacement front sway bar bushings for use on the 1970 - 1981 Camaro, Firebird, Trans Am, with stock suspension. OER reproduction front bumper stabilizer for use on all 1967-76 Firebird models. The rubber biscuit separates the front bumper from the mounting brace. 2 required per vehicle. New replacement front sway bar suspension bushings for the Upgraded suspension found on Z28, Formula, and Trans Am models. 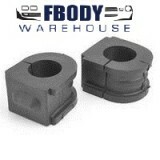 New replacement front sway bar suspension bushings for the standard suspension found on Camaro and Firebird models. With STANDRD BASE front suspension and 1 inch thick front sway bar. 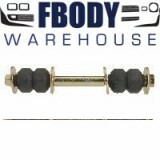 This is a new replacement front sway bar end link repair kit for use on all 1970 - 1981 Camaro and Trans Am models. This is a new replacement front sway bar end link repair kit (Heavy Duty) for use on all 1970 - 1981 Camaro and Firebird / Trans Am models. 1970 1971 1972 1973 1974 1975 1976 1977 1978 1979 1980 1981 Models with high performance suspension options. This is a chrome plated rear end cover for a 10 bolt GM rear end 1971 - 1981 Camaro Firebird Trans Am. This is a new replacement front tie rod end outer for use on all 1975 1981 Camaro and Trans Am models. Camaro Firebrid Trans Am models. This is a new replacement front tie rod end inner for use on all 1975 1981 Camaro and Trans Am models. Lower your car 2" without affecting steering or suspension geometry. Spindles are cast from the highest quality Ductile Iron with CNC machined 4130 Chrome-moly pins. Attaches to stock ball joints and tie rod ends. Moves wheels out an 1/8" on each side and works with most 14" disc brake wheels (3-1/2" max wheel backspacing). No need for bolt-on caliper brackets. Disc brake applications only. Will work with factory brake components. This is GM used front sway bar in excellent condition. Unit has been cleaned and dusted with black paint for a fresh look. This is a pair left / right of the front sway bar braces found on 1977 - 1981 Firebird Trans Am and Camaro with the standard suspension.